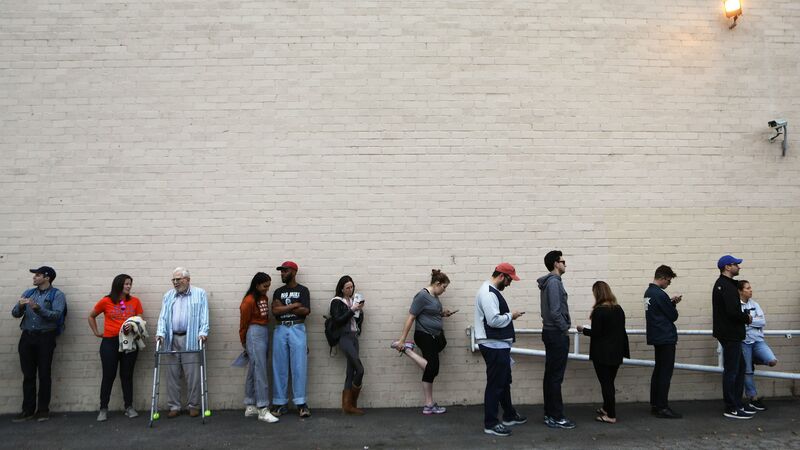 It's Election Day, and many Americans across the country who made their way to the polls early this morning were met with bad weather, long lines, power outages or no one to open the polling site. Why it matters: There have been reports and fears of election interference and voter suppression in certain states including Georgia. Even without intentional manipulation, lack of preparation or technical difficulties can cause miscalculations or prevent people from casting their ballots. Much of the eastern U.S. was hit with rain and storms Tuesday, which could decrease voter turnout, particularly among Democrats. New York: Throughout New York City, ballot readers failed, "thwarting thousands of would-be voters and forcing hundreds to abandon polling places rather than endure waits that sometimes exceeded an hour," Bloomberg reports. This morning, poll workers had trouble unlocking a polling site in Brooklyn, causing it to open late, according to PIX11. Rhode Island: Some polls had a late start because of technical issues or workers arriving late. Pennsylvania: The judge of elections had a medical emergency and was unable to open one polling place in Pittsburgh, according to the Pittsburgh Post-Gazette. The equipment needed to start the ballot machines was also not on site, and at 9:15 a.m. — more than two hours after the polling was slotted to begin — the machines were still not in service. Tennessee: At a polling place in Knoxville, voters who showed up to the middle school that housed a polling site had to cast paper ballots as the location had a power outage Tuesday morning and its generator failed as well, CNN reports. South Carolina: The Richland County elections director told CNN that he was seeing more frequent issues with calibration for older voting machines — meaning the wrong candidate was being accidentally selected. When voting machines are not working properly, voters can submit emergency paper ballots at the polling place. Those will be tabulated later in the day. Arizona: One polling site was foreclosed on the day before Election Day in a town outside of Phoenix, Arizona, according to USA Today. The issue was eventually solved and the site was opened late. North Carolina: The North Carolina State Board of Elections released a statement explaining that in some polling locations, high humidity was causing issues with ballots being read by voting machines. Texas: One precinct in Arlington, Texas, ran out of enough paper ballots while dealing with machine issues, according to CNN.